If you notice the signs that you are dealing with gum disease, you need to head to our dental offices. The sooner you treat gum disease, the easier it to stop it. Our dental professionals can help determine the stage of gum disease and can figure out the best way to treat it. Treatment options depend on many things, but there are several ways to treat gum disease and restore the health of the gums. The types of treatment range from making minor changes in oral health habits to performing oral surgery to correct the problems. There are also some things that you can do to help any type of treatment. • Professional Cleaning - When gum disease is caught in the earliest stages, it does not require much to treat. A professional deep cleaning to remove the plaque and bacteria from the teeth and gums is done during an office visit. Follow-up care involves practicing good oral health habits. At this stage gum it is not difficult to regain healthy gums. • Scaling and Root Planing - This is a procedure for when the gum disease has advanced further. The plaque and tartar expose the tooth and the roots of the teeth. Deep cleaning is not enough. Scaling involves scraping the plaque off the teeth and gums. Root planning involves smoothing down the teeth and gums after scaling is done to remove any pockets where bacteria and plaque can grow. • Gum Grafts - Gum disease exposes the tooth and the roots of the tooth. It causes the gums to recede. 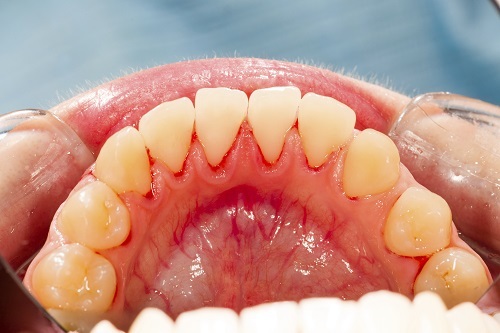 This leads to more gaps between the teeth and gums and leads to many problems. The treatment for this is gum grafts that use tissue to cover the exposed roots and teeth. There are some things you can do at home to improve any type of treatment for gum disease. Good oral health habits and home remedies such as oil pulling can help the recovery from gum disease and can prevent it from returning. For more information about this, contact our dental professionals to schedule an appointment.